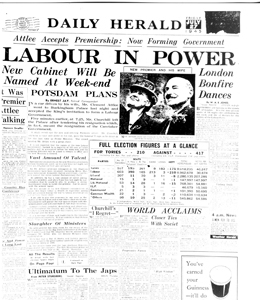 It is seventy years this week, since the Labour Party achieved a landslide victory after the war. It must have been so exciting looking forward to peace, to the promise of a better world for ordinary people. Homes for all, and a National Health Service, a Welfare state. The incoming socialist Labour government, led by Attlee, and inspired by Bevan, brought in popular policies, especially the introduction of a universal National Health Service, and an extensive social housing building programme. To the disappointment of many, a universal National Education Service was not an outcome, and this omission led to decades of disruption to an education service which, as I write, is now at a point of re-privatisation. 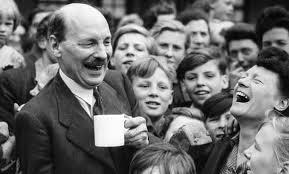 Had Attlee’s government made the brave decision to solve the problem of private and Church schools, and introduced a free universal education system for all, and eradicated private education, I believe it would have led to a fairer, and much more settled system which would have benefited all as the NHS has done. But seventy years on, that dream is still alive. Jeremy Corbyn wants to see a National Education System. Corbyn wants to see investment in education system from cradle to grave. Education is not about training for a job, about ticking boxes and league tables. Education is about enriching our lives – and life long learning. It is fifty years since Harold Wilson’s inspirational Open University which opened doors for so many. Sadly, Tory cuts and fees have taken the “Open” away and closed doors to this university without walls. Education should not end with a school certificate. There is so much knowledge and skills to share. Education benefits us all. Corbyn’s Education policy will put an end to tuition fees, and restore grants. Building on that, his plan for an NES and a life-long learning service will open up education for everyone and enrich our lives and our society. And we can start this dream at the very beginning of an incoming parliament. This is exciting, positive politics and the spirit of ’45 is alive again. While slashing college funding, George Osborne boasts of increasing apprenticeships. Yet too many are low quality, failing to give young people the transferable skills they need to get on. It is clear that some employers are using apprenticeships and traineeships as a means of circumventing minimum wage legislation. This has to end. The minimum wage must be equalised across the board – with no poverty rates like the current £2.73 per hour apprenticeship rate. Under a National Education Service, colleges should work in partnership with employers to mutually accredit apprenticeships and courses that offer high quality transferable skills. Councils and government agencies should also use public procurement contracts to guarantee good apprenticeships. The best employers understand the business case for investing in staff – in increased employee productivity and staff retention – and that’s why it is right to ask business to pay slightly more in corporation tax to fund it, while still leaving UK corporation tax the lowest in the G7. Government must play a strategic co-ordinating role in a modern economy. For too long the UK approach has been to stand back, ‘let the market decide’, then hope for the best. A National Education Service will be a lifelong learning service for a lifetime of opportunity. This entry was posted in Children and Youth, Education, Employment, Government policy, Party Organisation, Policy Documentation, Privatisation, Science and Research and tagged Attlee's Government, Jeremy Corbyn, National Education Service, Open University by Pamplemousse. Bookmark the permalink.